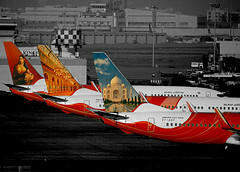 Airliners-India :: View topic - The Dream)liner Deal - amazing flight on Air India! The Dream)liner Deal - amazing flight on Air India! Posted: Sat Sep 15, 2018 4:33 am Post subject: The Dream)liner Deal - amazing flight on Air India! Well, not often do you hear about a positive flight on Air India: it is either hush hush, or the entire world's spotlight is on Air India. A flight I take very often, I wasn't left disappointed by my mundane choice. I went in with low expectations - but I arrived happy. A new plane, a cheerful crew, amazing food (albeit vegetarian, but who cares?! Not peanuts & pretzels!!) and some lovely views of the Himalayas. A delightful trip report on your milk run route, Sir! Once again, lovely descriptions of the scenes at my home airport, and lovely wing pictures, with the beacons, and some nice combination of morning hues, lights and aircraft illumination. The food was decent enough. It is nice to see CCU now open up gates 14/15, in addition to 16/17, since the domestic loads have got larger. CCU's luggage delays are quite usual, and disgusting. That Dobby picture has been one of your best: I can nearly hear him in the picture, full of a silent joy on seeing you. We will all miss him. Thank you for a lovely trip report, Sir! - food looks good/standard for AI. Not many airlines remain which will feed you hehehe lets see how long AI continues.